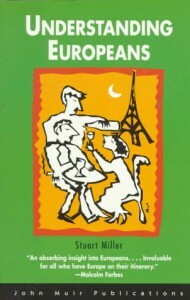 Understanding Europeans, Stuart Miller, Avalon Travel Publishing, 1996 (c1990), ISBN 9781562612948, 258pp. “Tell them you’re a writer.” That is a chapter title in this book, and it illustrates one of the differences between Europeans and Americans. For me, this chapter struck home. I have been working towards a career in writing recently, first by applying to graduate school where I hope to complete a Masters of Fine Arts degree. But when people ask me what I plan to do with that degree, I can not tell them the truth: that I want to write. Instead, I have to say that I plan to teach or take an editing position along with writing (which is true–I am not so naive as to believe in a magical diploma that opens up the world of publishing–but it is akin to someone who is studying to be a surgeon to say that they plan to work as an intern). In some ways, I feel like St. Peter denying Jesus; I cannot admit to my true purpose because of what people might think. And that is because writing is not viewed as a proper occupation by the majority of Americans, whereas in Europe, that answer would be sufficient. This is indicative of my feeling for this book of Stuart Miller’s, which is supposedly about those folk across the water, but ends up helping describe my neighbor and myself much more. Although we are mostly aware of the Puritan and commercial streaks in our national character, to have it compared and contrasted to the Europeans makes it much easier to understand. There are some basic differences between our world views that Miller is able to pinpoint with some accuracy. 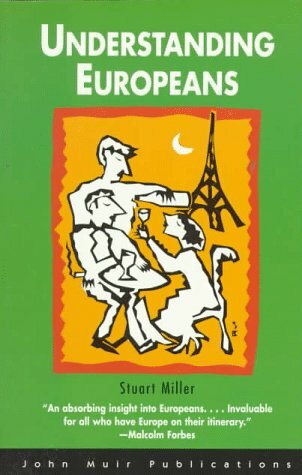 Understanding Europeans benefits from Miller’s use of his own marriage to a French woman as examples, but there are not enough of them to overcome some of the drudgery of his psychoanalytical approach to his subject. While slow at times, perseverance was rewarded by a comprehensive overview of the European state of mind. Although global communication is helping to homogenize the world (not a totally positive thing in my opinion), culture differences are still strong and go much deeper than the simple talk and entertainment that we might share. Nationalism, something Americans only understand to a small extent, once again is making itself known in Europe, and we would be wise to be aware of its past impact in history. Miller helps explain the psychology of Europeans, from the lingering effects of feudalism to the most recent trauma of a war that affected the entire family rather than just able-bodied men.